As government management in Israel is gradually replaced by private sector management, it is becoming apparent that the collective-oriented mission of government cannot be fulfilled by the private sector or by the non-profit organizations of civil society. This book provides an analysis of the machinery of government in Israel, highlighting the inadequacy of the private sector as an alternative and how public management will need to cope with the new challenges and pressures of the 21st century. Providing hitherto unpublished data and analysis in English for the first time, this book gives a comprehensive analysis of the issue of public and private-sector management. The author examines the tasks of the civil service; the legal foundation of the public management machinery; and the profile of civil servants, and looks at the unwieldy budget process; the prevalence (and absence) of regulation; and external and internal mechanisms of oversight. This analysis is balanced by a detailed exposition of Israel's political-administrative culture with its excessive centralization, secrecy, turf protection, and legacy of improvisation, and their effect on policymaking and administration. 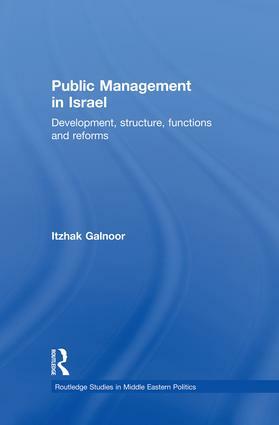 This comprehensive and detailed examination of public management in Israel will be of great interest both to students and scholars of business and management, government and politics, and to policymakers in the region. "I find the book particularly valuable on a subject that is as complex as it is almost unresearched, namely what does the Israeli civil service do? Galnoor, based on his experience and rich involvement in Israeli public service, for example as Civil Service Commissioner from 1994 to 1996, is able to point out some of the key behavior patterns of the civil service… Galnoor’s comprehensive examination of public management in Israel should be of great interest to both students and scholars of business and management, government and politics, and public law, as well as for regional policy-makers." - Assaf Meydani, Centre for Socio-Legal Studies, University of Oxford, and the Academic College of Tel Aviv-Yaffo; Israel Studies Review, Vol.28, Issue 1, Summer 2013. Izthak Galnoor is Herbert Samuel Professor of Political Science at the Hebrew University of Jerusalem and Senior Fellow at the Van Leer Jerusalem Institute. He was Head of the Civil Service Commission from 1994--6 and served on the Executive Committee of the International Political Science Association. His research interests lie in the areas of Israeli politics and administration, comparative politics, and political humor. His new book, The Israeli Political System (with Dana Blander), will appear in 2011.